[Choi Ka Fai] has been experimenting with neurostimulation for some time now. His body of work has focused on exploring the possibility of using neurostim devices to replay pre-recorded muscle movements. Until now, he has been recording his muscle movements as acoustic waveforms for real-time playback in the bodies of his research partners. This usually requires him to sit beside the subject, tethered to a machine. This tends to limit his movement, so he has invested in a new form of movement recording technology – a Kinect sensor. Using fairly standard skeleton tracking as we have seen in some previous Kinect hacks, he has enabled himself to direct the motion of his subject by merely moving in front of the camera. The benefit of using the Kinect over wired sensors is that he can use any body part to direct his partner’s movements by simply changing how the software interprets his actions. As you can see in the video below, he uses his hands, knees, and even his head to direct the motion of his partner’s arm. It really is a neat application of the Kinect, and we are totally digging the shaky “human marionette” effect that it produces. Since this was only an initial test of the system, expect to see some more cool stuff coming from [Choi] in the near future. 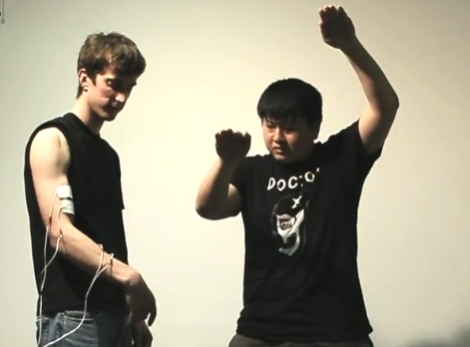 Stick around to see a quick video of the Kinect-driven neurostim rig in action. Umm, if he truly wants to minimize interference from his non-disabled “partner”, he should have him blindfolded. The fact that the partner can see what motion is desired totally invalidates the results. I could make this same clip with some fake wires and a mime. he don’t look too happy in the video and whats with the sound in the background? What the hell are those noises? I agree to bob’s fact. That’s what watching the video made me think, last neurostimulation we had here on Hackaday was a fake, wasn’t it? I see this being used on an entire set of backup dancers. So we’ve all agreed this is fake, right? There were times when the guy’s arm movements were reversed for a few moments as he thought about which way he should move. Not only this looks fake, but I don’t see anything new here : Kinect is easy to use and this neurostimulation does not look much more advanced than these crappy “muscle trainers” sold on TV. I think that the puppet guy merely receives barely controlled electric impulses and tries to follow the other guy’s movements using an intelligent optical feedback system : his own eyes and his brain. If I am missing something, please feel free to correct me and point it out. What would be Awesome with a capital A is to use the Kinect as a feedback device for this type of system. Input the desired arm position, and then have the device increase the pulses to all the correct muscles until the Kinect validates that the correct arm position is being approached or the subject is dead. Whichever happens first. Can this tech conceivably control presidents, if a chip were to be surgically implanted to the head? This is ridiculous. Show it to me when the tall guy is blindfolded and that stupid sound is turned off! It’s not fake. It may be exaggerated, but it isn’t fake, the guy is getting zapped. There are certain cues that you pick up on, such as involuntary face muscle contraction from being electrocuted. If you own a TENS machine and played with it enough, you’ll know this is vid is at least authentic in that he’s getting zapped pretty bad. Pay attention to the arm muscle frequency(ripple on skin), you cannot do that unless pulling on something heavy. Also, look at the bicep spasms, not easy to do without making the rest of your arm twitch like crazy. I think people like to look at anything they can and yell fake. Do they think they look smart? I hope not, that’d be wrong.